The report also notes that Millennial consumers represent 45% of ‘dualists’ (those who consume both cannabis and alcohol), which is a sobering statistic for beverage alcohol companies who are trying to capture long-term share of mind and wallet among this important demographic. The new wide-ranging report, Beverage Alcohol, Cannabis and the Changing U.S. Consumer: What are the Real Risks and Opportunities to Consumption Behavior?, is a cooperative initiative between IWSR Drinks Market Analysis and BDS Analytics, the data, intelligence and consumer research experts in the fields of beverage alcohol and cannabis respectively. The US cannabis industry has seen an explosion of growth within the past few years – 10 states have now approved adult recreational usage of cannabis products and 34 states have approved cannabis for medicinal purposes. All but two of the remaining states allow for cannabidiol (CBD) products. The IWSR/BDS Analytics study is a comprehensive and far-reaching examination of the state of the current industry, alcohol and cannabis consumers and consumption occasions, trends, risks and opportunities, and growth expectations. “Our research shows that up to 40% of adults 21 and over consume cannabis in states where it’s legal. Cannabis presents substantial opportunities across consumer industries, including new occasions that alcohol cannot and will not play,” said Jessica Lukas, vice-president, BDS Analytics. The report also details areas where beverage alcohol and cannabis can and do coexist. Though some cannabis use is starting to emerge during occasions that have been traditional alcohol occasions, the study indicates that cannabis and alcohol are often not always appropriate for the same occasions. “Though not yet mainstream, cannabis adoption is certainly growing in states where it’s legal and does pose a risk to the beverage alcohol industry in the future,” said Brandy Rand, IWSR’s US president. The report notes that cannabis and alcohol are different, and not every dollar spent on legal cannabis is a dollar taken from alcohol. Nonetheless, it warns that it is critical for beverage alcohol companies to prepare today to meet consumers’ needs as these markets continue to mature and overlap. In states where cannabis is legal, alcohol consumption still remains higher, with twice as many legal-aged adults consuming alcohol compared to cannabis. Two-thirds of cannabis consumers in fully legal cannabis markets also consumed alcohol, however, only approximately one-third of alcohol consumers in these markets also consume cannabis. More than 50% of people indicate that they have ever paired cannabis with alcohol, though few pair the two together often. When they do pair, half say they drink less. On average, cannabis and alcohol dualists are more likely to drink beer (especially craft beer) and spirits; fewer drink wine. Baby Boomers tend to be more alcohol exclusive, while Millennials prefer interchanging cannabis and alcohol, or just consuming cannabis. Cannabidiol (CBD) is exploding as an ingredient of interest among both cannabis consumers and non-cannabis consumers. Edibles (which includes beverages) represent 53% of CBD product sales. 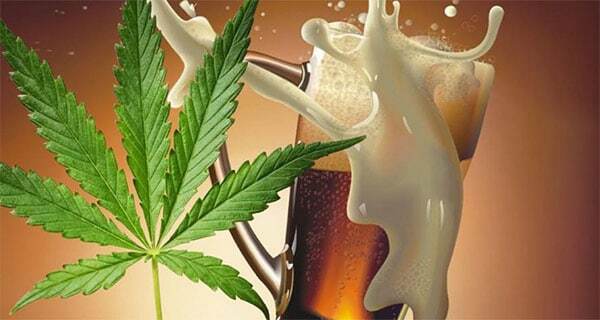 44% of cannabis and alcohol dualists say that marijuana should be sold in the same stores as alcohol. About the IWSR: A leading source of data and intelligence on the alcoholic beverage market. The IWSR’s database, essential to the industry, quantifies the global market of wine, spirits, beer, cider and mixed drinks by volume and value in 157 countries, and provides insight into short- and long-term trends, including five-year volume and value forecasts.